Need a quick snack for those chilly Fall mornings? 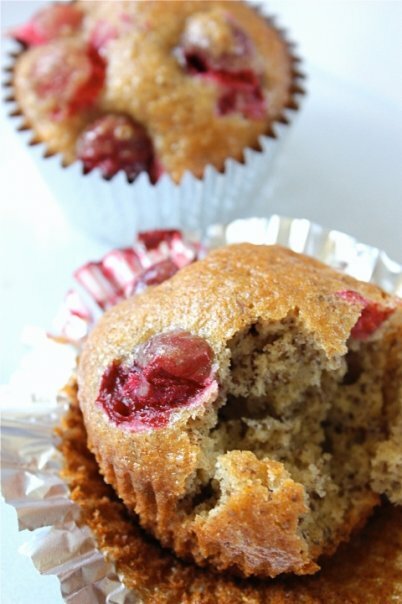 Cranberry Walnut Flax Amish Friendship Bread Muffins make a tasty, healthy, grab-n-go breakfast. In a large mixing bowl, combine all dry ingredients except flax meal, cranberries and nuts. Make a well in the center. In a smaller mixing bowl, combine all wet ingredients including flax meal. Add wet ingredients to dry ingredients until just incorporated, careful not to over mix. Fold in cranberries and nuts. Dust the greased pans with a ½ cup sugar and ½ teaspoon cinnamon. Pour the batter evenly into muffin tins. Sprinkle the tops mixture of sugar and cinnamon. Bake for 15-20 minutes or until the bread loosens evenly from the sides and a toothpick inserted in the center of the bread comes out clean. Spice it up! Substitute 1/2 teaspoon allspice for 1/2 teaspoon cinnamon. We also use organic golden flax in our recipes to reduce the amount of oil in the recipe and provide a healthy boost of omega-3 ALA. I love making the friendship bread. I make it and keep it all, and give some away. Thank You for giving it to me. I made this and it was very good. It was snowing and I didn’t want to shop, so I used what I had on hand: almond coconut milk instead of milk, dried cranberries instead of whole ones, and whole wheat flour. I added a small splash of extra milk because of the dried berries. I didn’t have enough white sugar so I used some brown sugar. I wasn’t sure about using a whole cup of ground flax, but it was great. I actually made 12 regular muffins, 12 mini muffins, and a small 5×9 glass pan. The hard part is using restraint when it comes to eating them! I love having all these wonderful recipes with so many variations. Thanks for a very useful site!